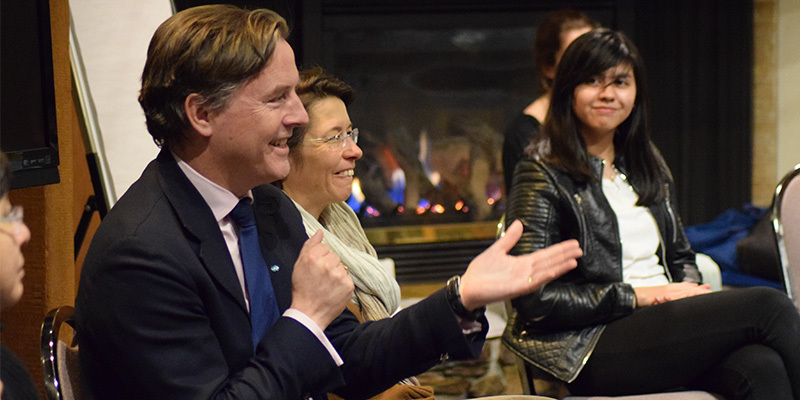 Pearson College UWC — Canada’s only United World College – was honoured to host more than 70 education leaders from around the world at last month’s biannual meeting of UWC Heads, International Board, College and School Board Chairs and representatives of National Committees. During the multi-day meetings, UWCers discussed weighty topics such as safeguarding students and practical plans to improve mental health supports for all those who attend UWC schools and colleges as well as how the movement can continue to its efforts to create a culture of support and well-being on all 18 campuses. That “18” isn’t a misprint! In one of the most heartwarming and empowering moments of these meetings, UWC representatives unanimously approved International School Moshi (ISM) in Tanzania as the newest member of the UWC Movement. After a multi-year evaluation and process, the UWC International Board approved this exciting addition thanks to the school’s alignment with the Movement’s strategic goal to increase UWC’s impact and, in particular, its reach in the Southern Hemisphere and Africa. The official name of the school, the second UWC school on the African continent after Waterford Kamhlaba UWC of Southern Africa, and other details will be shared later. Heather Gross, Pearson’s Vice-President Education and Programming and Deputy Head, noted that one of the keys to this biannual gathering, held at various UWC school and host communities, is that it facilitates productive, face-to-face discussions, encourages improved sharing of best practices and lessons learned and inspires better understanding of the unique – and common – challenges that the very distinct and diverse UWC schools face. Another important, ongoing discussion concerns the possibility of framing options for UWC students beyond and within the traditional International Baccalaureate (IB) Diploma program. The movement, in many respects, an early-adopter of the IB program (Pearson was the first IB school in Canada, for example), and is committed to continuing to be a leader in a global education experiences that offers both a demanding academic experience and a service-oriented and experiential program that is relevant to the needs of students in the 21st century. The UWC meetings – the first the biannual gatherings hosted by Pearson in several years — were officially kicked off with a reception at the British Columbia Lieutenant Governor ’s official residence hosted by Her Honour Janet Austin. An honoured guest was Her Excellency, Canada’s Governor General Julie Payette, who is an alumna of UWC Atlantic in Wales and a strong supporter of the UWC Movement. Both vice-regal representatives, together with UWC meeting attendees, were treated to a mini-One World performance by Pearson students who would go on the following weekend to perform for thousands of Victorians at the annual downtown show and expo. Désirée McGraw, Pearson’s President and Head of College, thanked the many people on campus and through the UWC International Office who worked hard to make the meetings a success. She added, “Former prime minister Lester B. Pearson famously asked, ‘How can there be peace if we don’t understand each other and how can we understand each other if we don’t know each other? That is what the UWC is all about – creating a powerful, shared experience across diversity in all its forms. NOTE: You can view the reception speeches delivered by the Governor General, Lieutenant Governor and Ms. McGraw at this link. We apologize for issues with the sound quality.